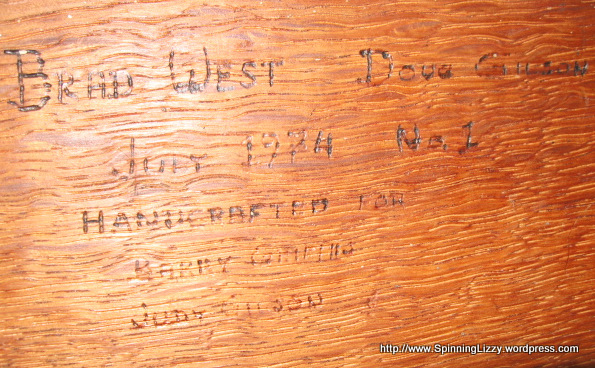 This miracle comes courtesy of Warner Lord, who graciously provided the pictures and information for this post. 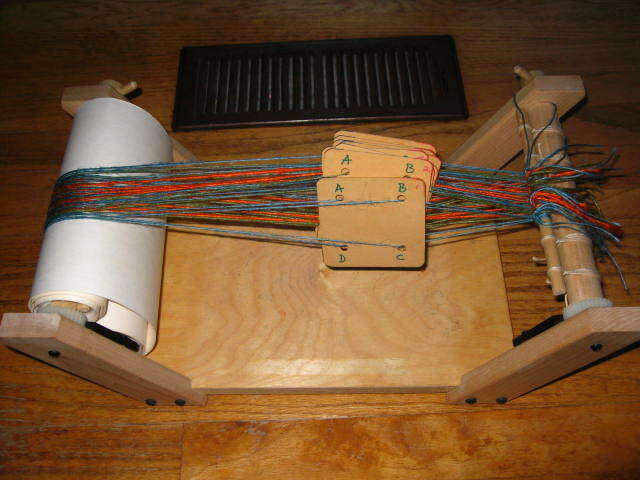 Presenting… The Bergman Suitcase Loom, patented in 1933! 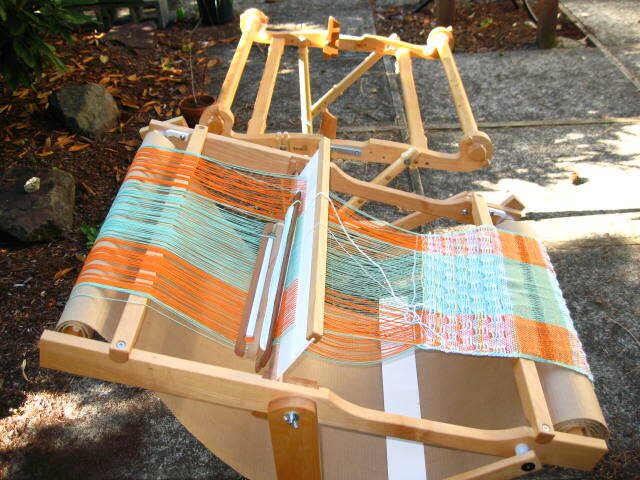 Warner acquired his Bergman suitcase loom in the 1970s from its first owner, and has used it to weave many overshot bureau scarves and table runners. 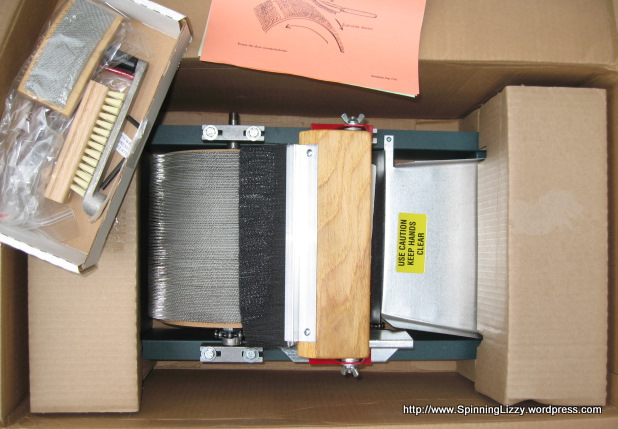 It’s a portable, four-shaft, six-treddle counterbalance loom! 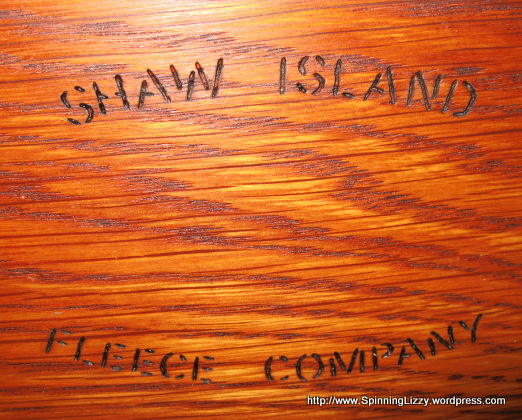 Measurements are 43 1/2″ tall, 24″ wide, and 26″ deep; it’s currently warped with 20/2 cotton. 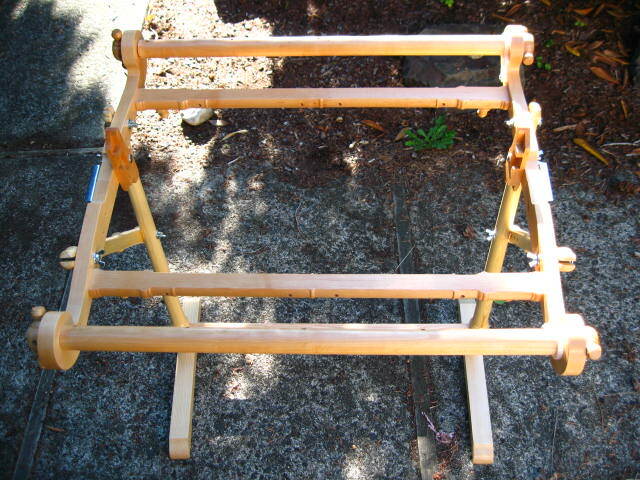 The legs and treadles fold up, the heddles supports fold down, and the front and rear cross pieces between the bottom of the legs fit into notches in the front and back to make lovely “suitcase” about 24 x 26 x 10 inches. 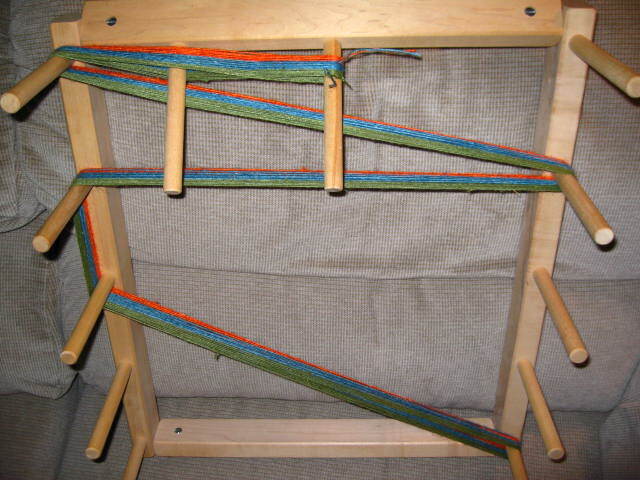 The warp and tie-up are never disturbed. 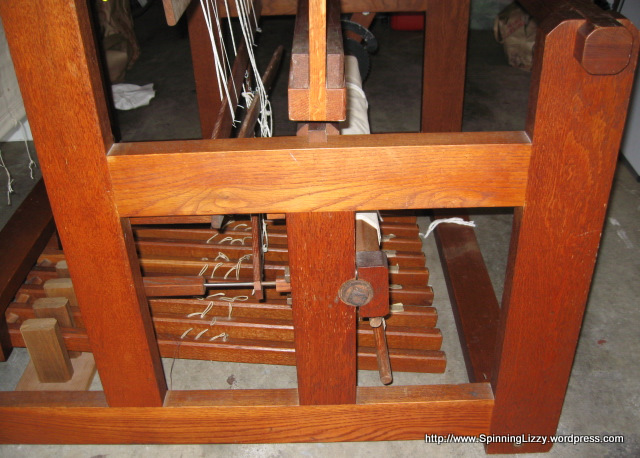 The other loom is 55″, four-harness rising shed loom and is also folding in that the front and back beams are adjustable as to their distance from the heddles. When totally collapsed it takes up very little space. 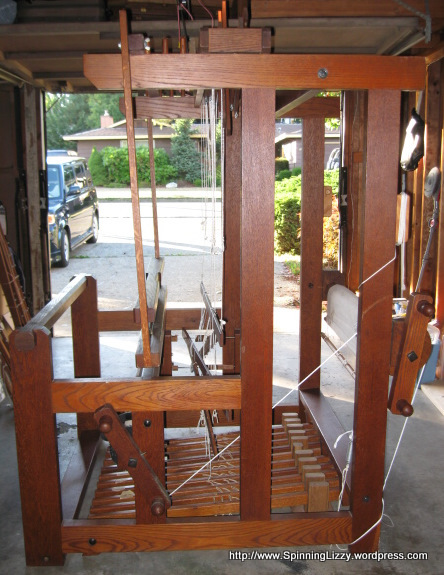 It was hand built and patterned after a Macomber loom. 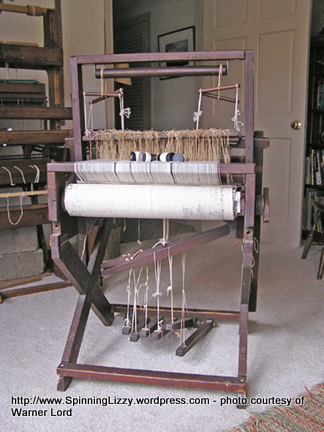 Check out the great weaving room and display of shuttles on the wall! Many, Many Thanks to you, Warner, for sharing these marvelous sights with us! 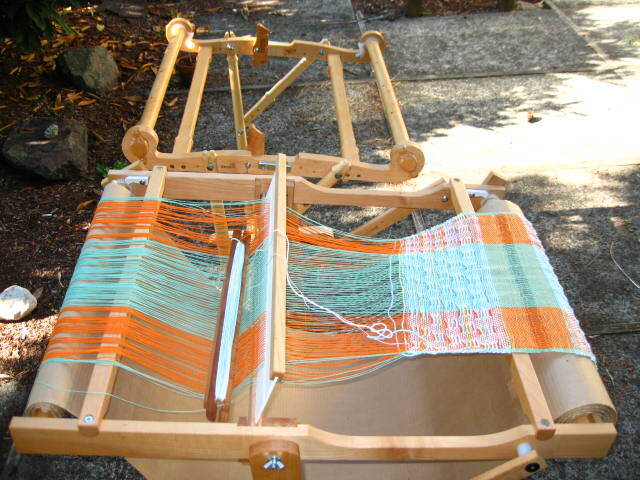 First of all, It’s an “apples-to-oranges” comparison, since the The Kromski is a newer, folding loom, while my Schacht is an older version that does not fold. 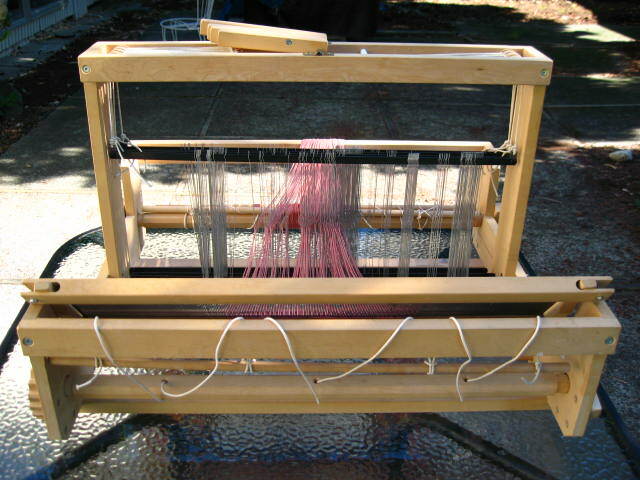 For more of an “apples-to-apples” comparison to the Harp, Schacht makes the Flip loom that has many of the newer features. 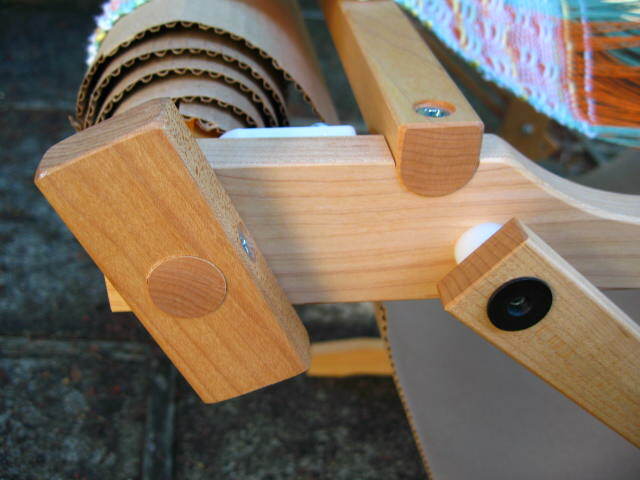 A summary of the major features the Kromski has that my Schacht does not have: the Harp folds, is more portable, has holes drilled on its underside for pegs so it may serve as a warping board, and accomodates a second heddle after installing a second set of (optional) heddle blocks. 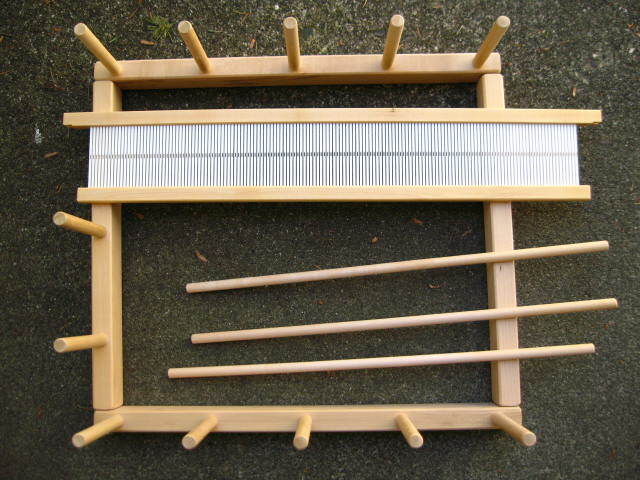 Except for doubling as a warping board, I believe the Flip has all the other features the Harp has. 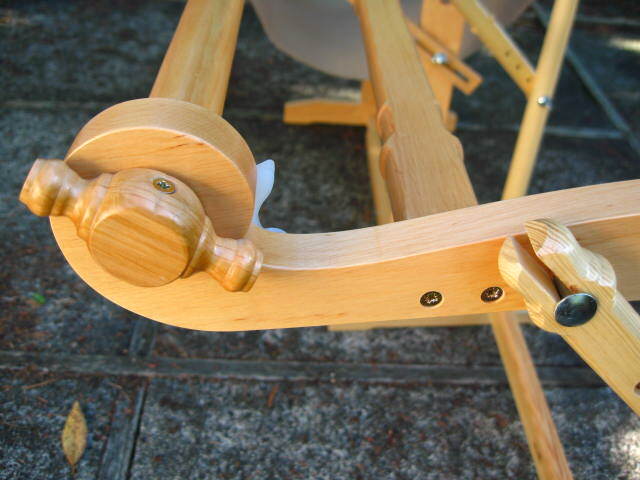 The Kromski has many ornate details and turnings, whilst the Schacht line is more Shaker styled. 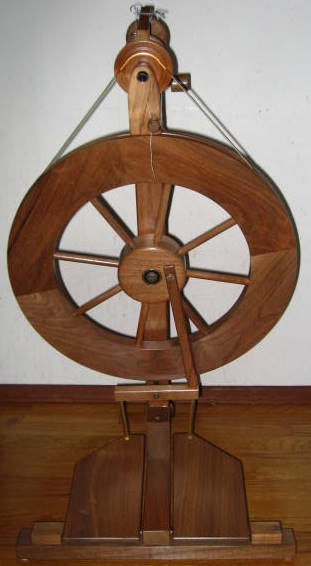 The Kromski has a much shorter length between cloth (front) beam and heddle than the Schacht. 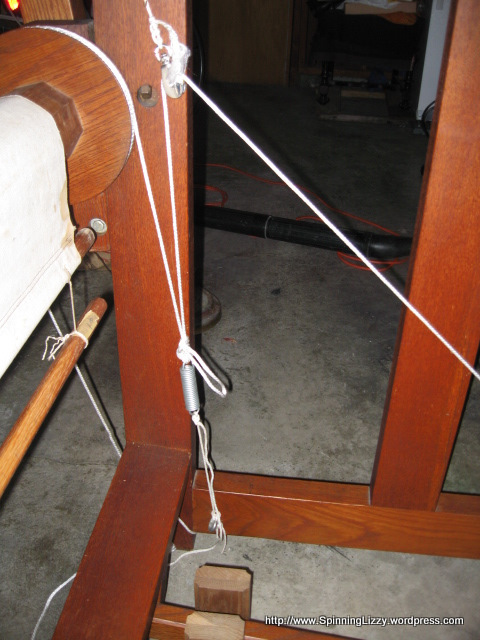 The Kromski’s length from heddle to back beam is only a little shorter than the comparable length on the Schacht. 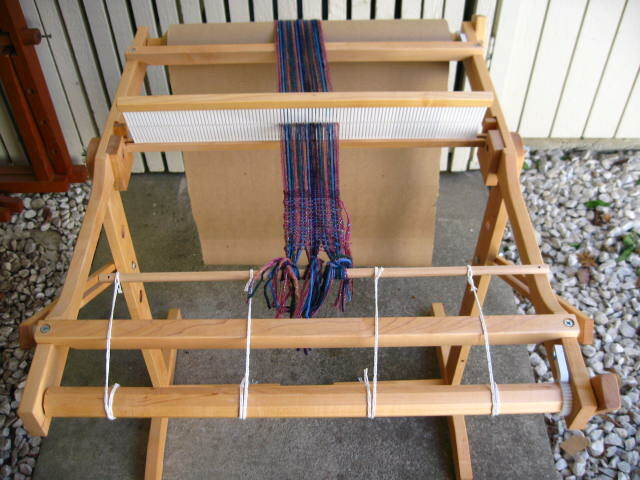 I talked to the folks at Schacht and my understanding is that the Flip is very close in measurement to their regular rigid heddle loom of the same size. 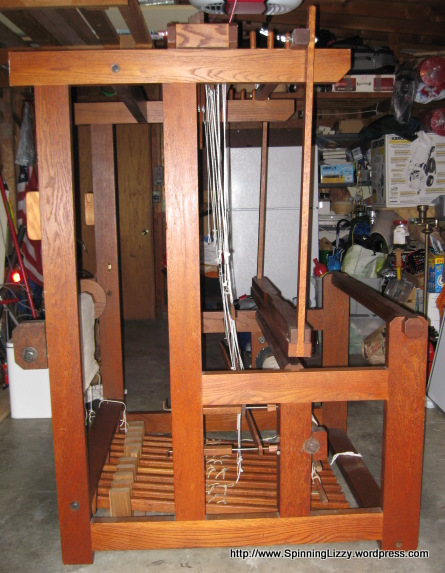 ETA: A friend on Ravelry just pointed out to me that the Schacht has a front and rear beam, on top of the vertical frame, that lifts the warp and produces a better shed. I completely agree with her that this is a major selling point. 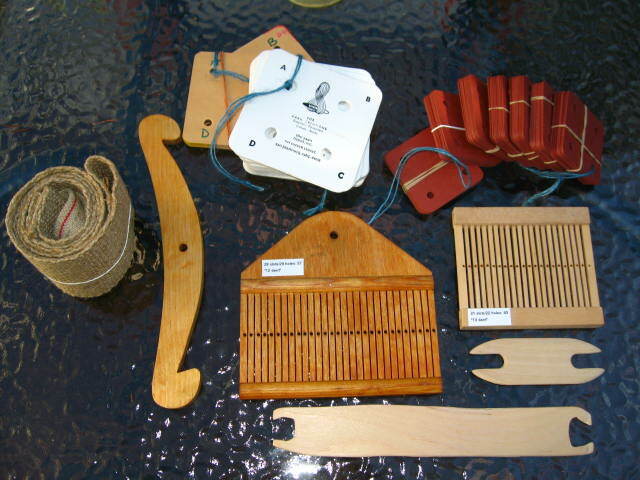 I think the Kromski is made of fir or beech, while the Schacht is made of maple. 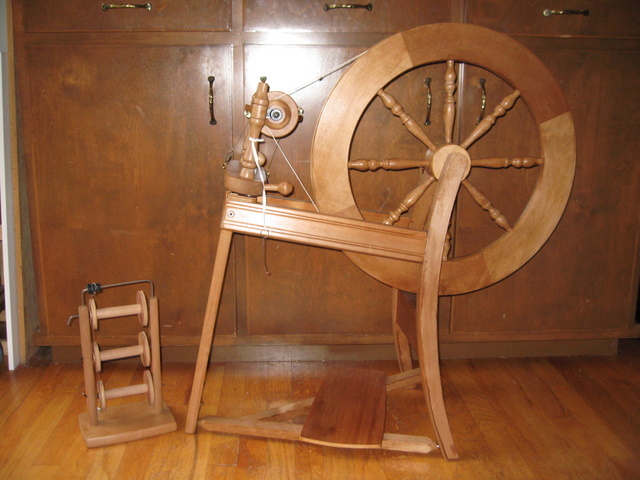 The stands made for the Kromski rigid heddle looms are unique to each size; this 24″ loom stand will not fit the two other Harp sizes (16″, 32″). 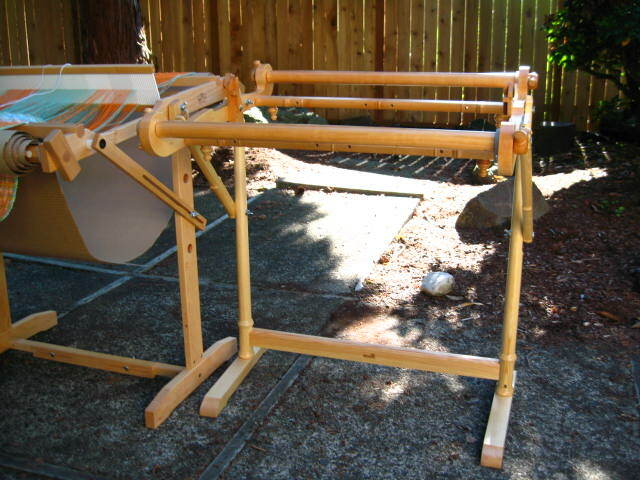 The stand for my 20″ Schacht loom will also accomodate the 25″ size, as well both sizes (20″ & 25″) of the Schacht Flip looms. 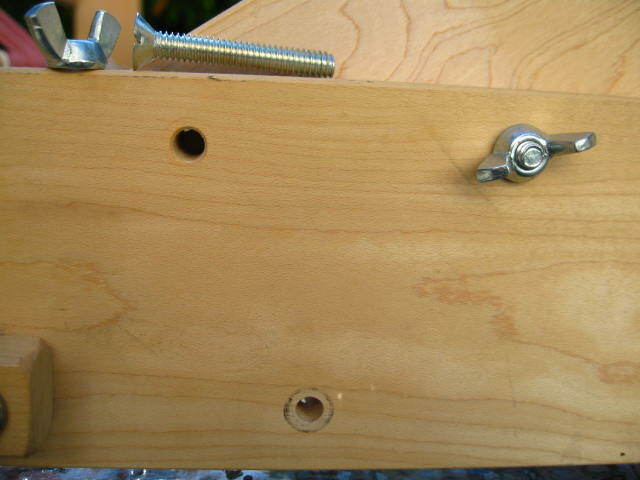 The Kromski stand is drilled with holes on the base on on the side to store the warping pegs it comes with. 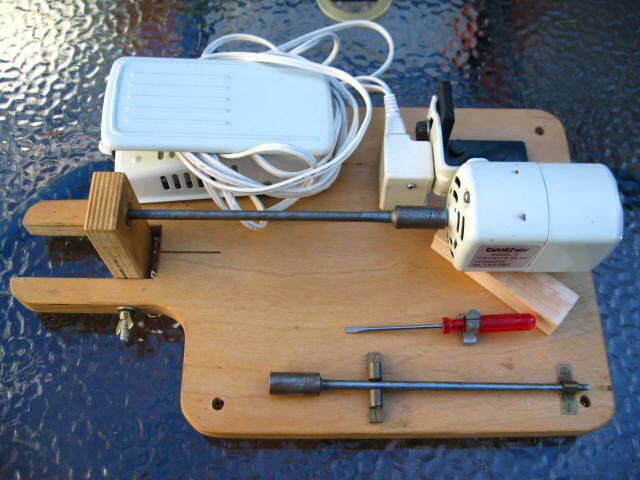 Kromski literature states that pegs installed on the sides of the stand can be used as a rest for shuttles or to hang extra tools. 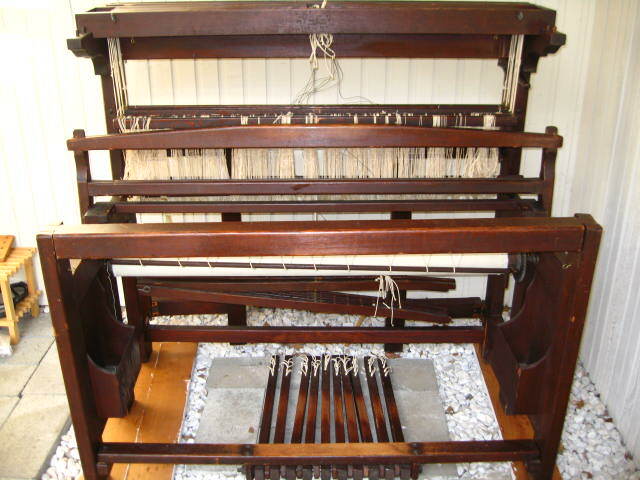 The Harp may be quickly released from its floor stand by loosening (but not taking apart) four bolts and then lifting the loom off the stand. 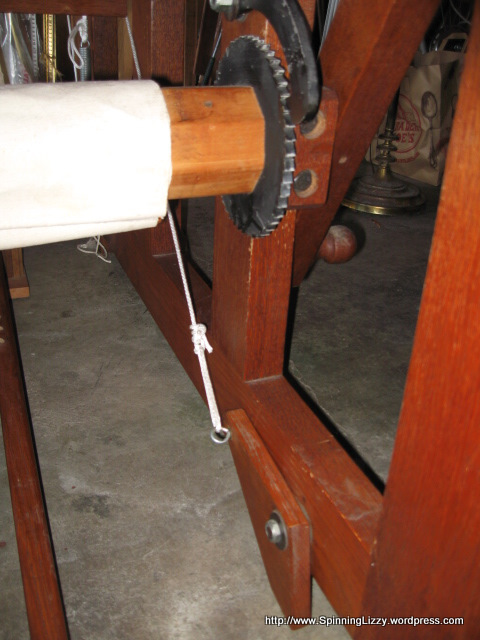 The Schacht requires you to loosen and completely remove four bolts (two of which require a screwdriver) before you can remove the loom from the stand (this is definitely bothersome). 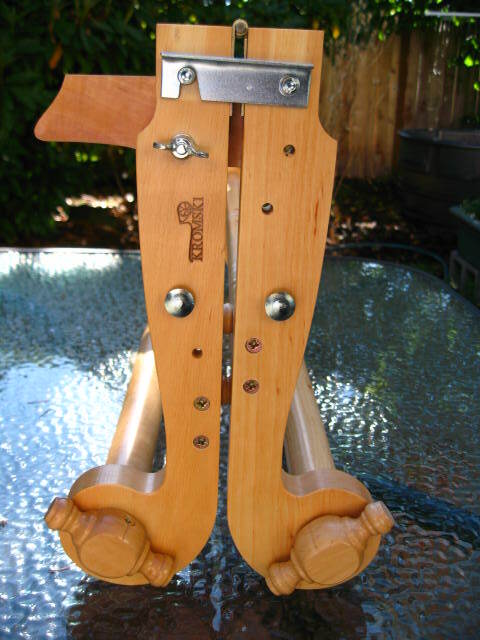 The stand for the Harp wins the quick-release contest hands-down, but this also means the Schacht stand is stronger. 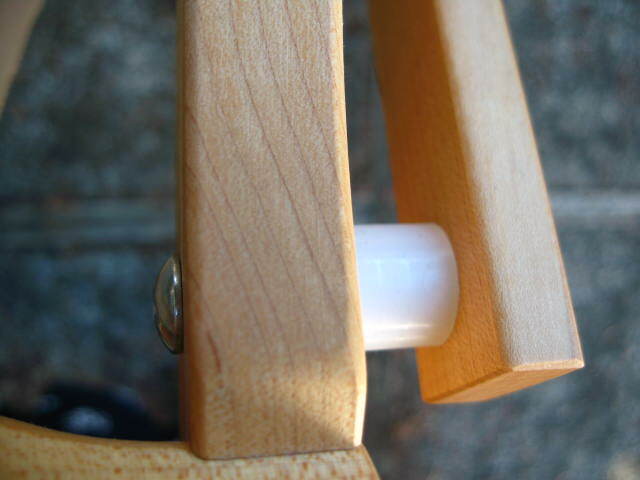 You can tell just by looking at the two stands that the Schacht stand is stronger and much more sturdy. 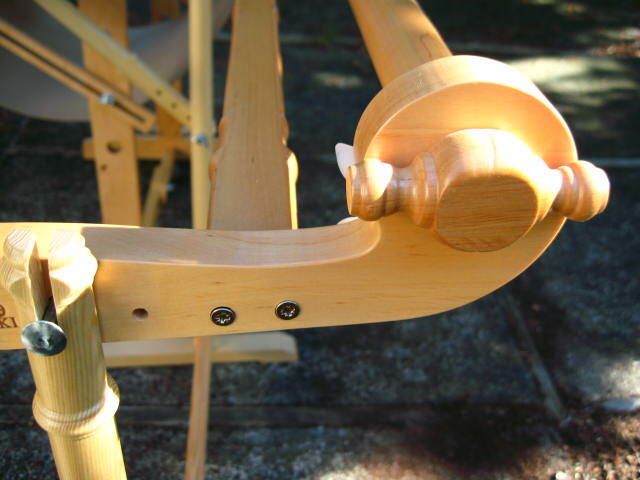 Both stands will adjust for variable height and angle of loom, but because the Schacht has brace bar is slotted so it can slide (see the picture above), it can allow for many more positions between the extremes of level and almost 45-degree below that, whilst the Kromski only allows fine-tuning of the level position. 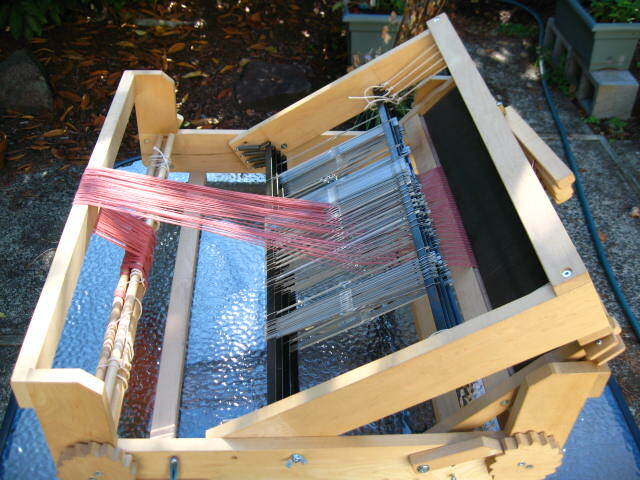 To be sure, most rigid heddle weaving is done with the loom at a level position, so I don’t know if using the steeper angles are useful for anything besides possibly tapestry weaving. 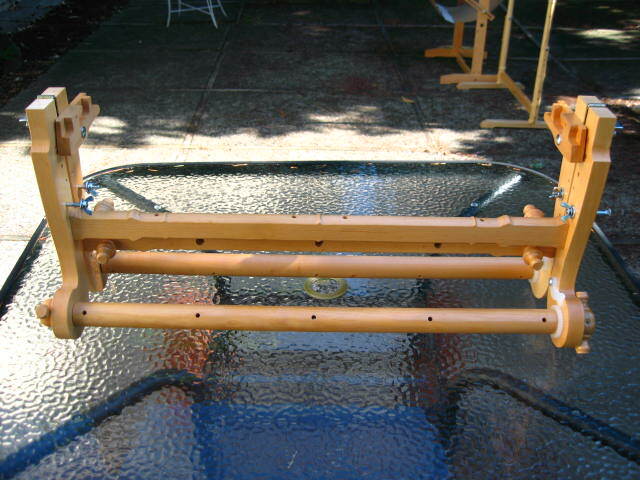 Although the Harp weaving width is larger than the Schacht, and can accomodate two heddles for more complex designs; I am partial to my Schacht for her strong, clean lines and maple wood. 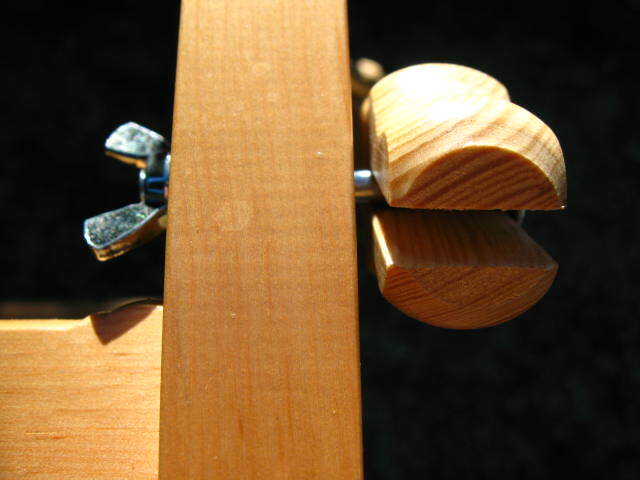 Personally, the curlicues of the Harp distract and do not speak to me, which is why I opted not to keep it. Mostly an emotional preference I cannot explain, but there it is. 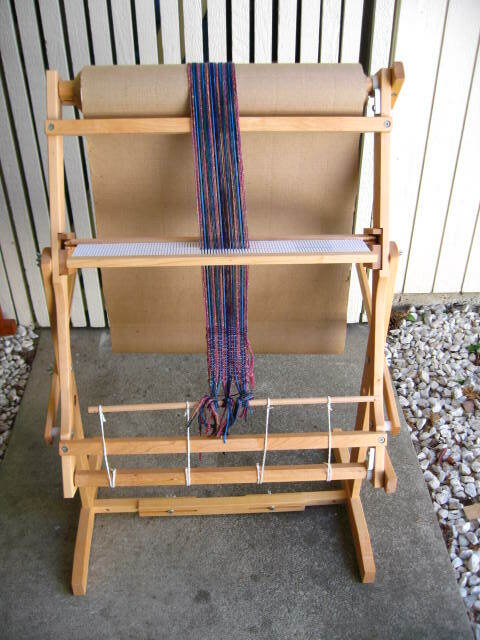 She’s a Schacht 20-inch rigid heddle loom. 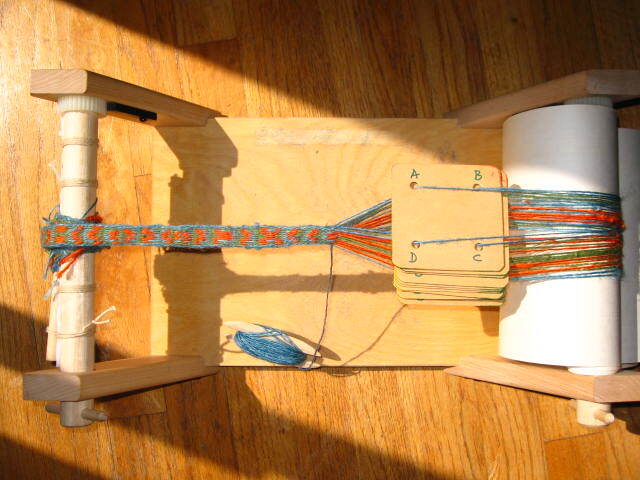 I don’t understand why the second heddle is a 25-inch one, since Hedy is a 20-inch loom. 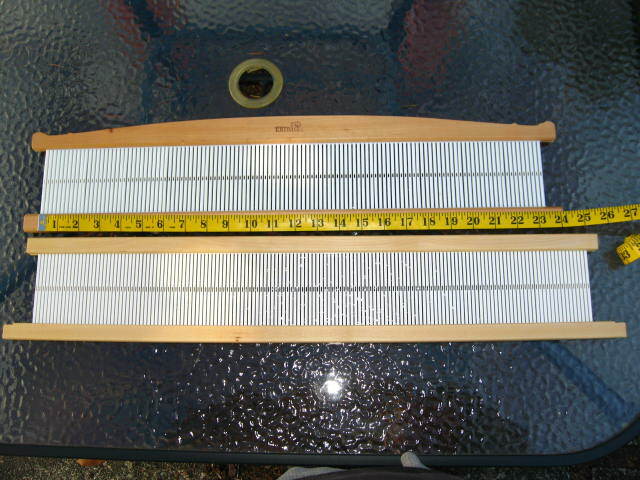 The 25-inch heddle doesn’t fit in the slot. 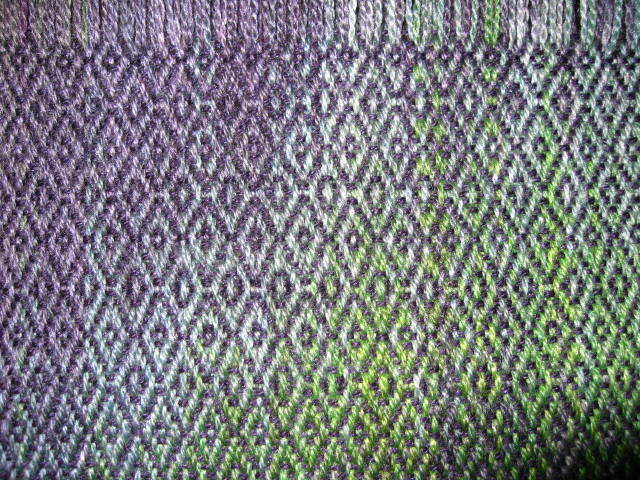 Another weaving mystery to solve. 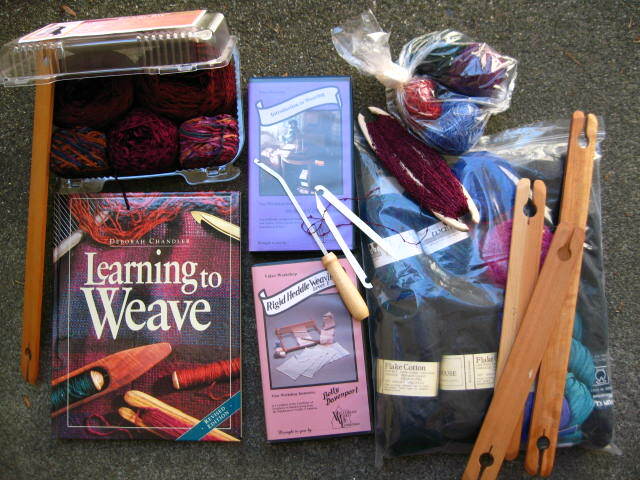 Two unused kits of weaving yarn, a great book, and two videos! 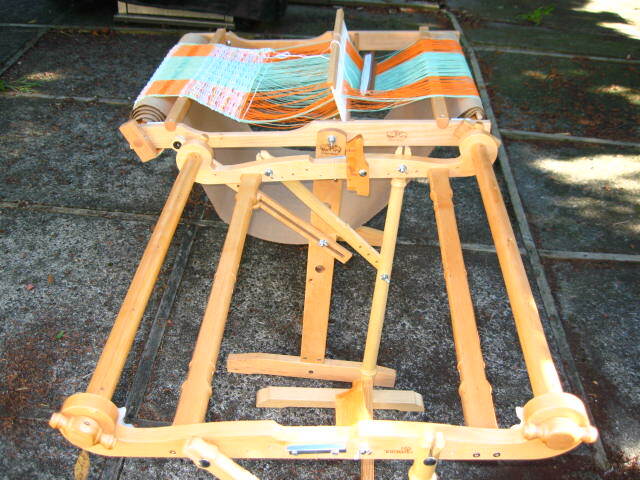 Hedy is in perfect condition — not a single scratch or mark on her, and the neat thing is, she’s already warped so I can begin weaving immediately! Since I began my fibre journey, I’ve met so many wonderful people, and that has been an unexpected gift that has made the crafting even more satisfying. The woman (and her husband) I got Hedy from was so inspiring, and I had the chance to see some gorgeous tapestries (Southwest designs) in her house. 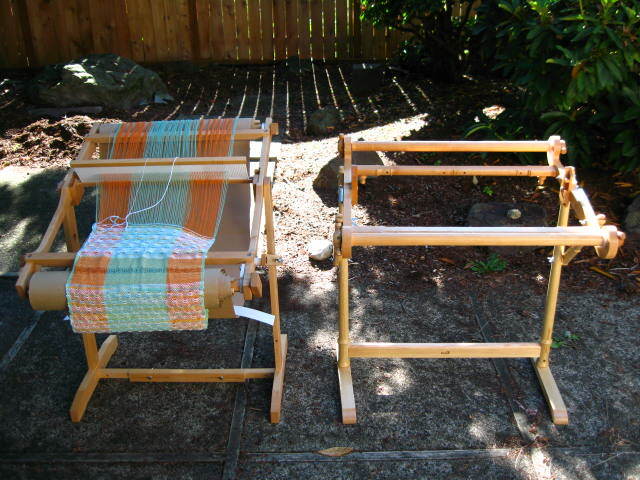 They weren’t of her making, but she told me they were the reason she wanted to weave in the first place –and it will be possible to make these things on Hedy! And now for a bit of trivia. 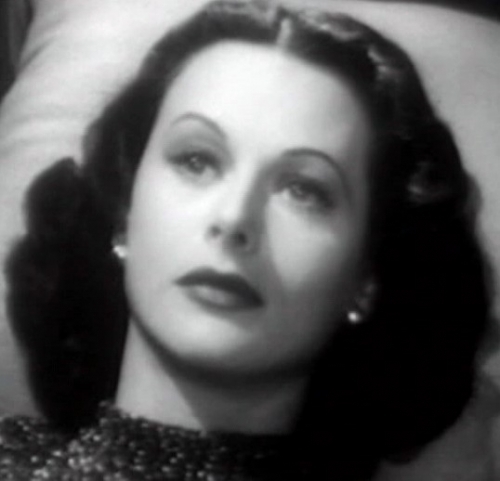 Hedy is named for Hedy Lamarr, born Hedwig Eva Marie Kriesler. She was more than merely a pretty actress. 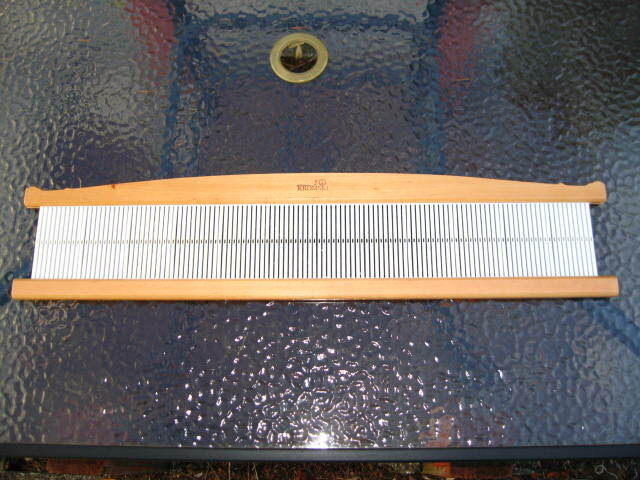 In 1942, she patented some technology related to spectrum wave technology, but the ideas were not used at the time due to the lack of mechanical technology. Ms. Lamarr died in 1959 2000; it was 1962, after her patent had expired, when the U.S. military made use of her ideas. Her technology was finally recognised and honoured in 1997. Hedy Lamarr was a woman far ahead of her time.